How does the Easter bunny get hopping so early? With a good breakfast, of course! Without a doubt, breakfast is the most important meal of the day. Breakfast means, “Break the fast”. For most of us, the body has gone through the night while we are sleeping (eight or more hours), without any fuel (or food). An early morning meal is essential to rev up your inner engine and keep it running smoothly all day. Research studies show that early morning is a time when the body’s blood sugar may be at its lowest levels. Eating a healthy breakfast will restore your blood sugar to get your mind and body going and may even help reduce the afternoon slump! A healthy breakfast should include at least three of the five MyPlate food groups. The five food groups are grains, fruits, vegetables, protein and dairy. 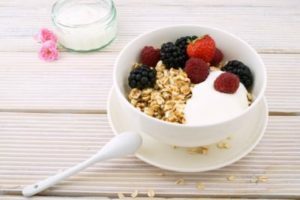 An easy, balanced breakfast can include a bowl of whole-grain cereal topped with a banana and low fat or non-fat milk. This meal represents three food groups; a whole grain, a fruit, and a dairy. Another thought, warm up leftovers! If you celebrate Easter, there might be leftovers from dinner, right? Warm up some leftover ham, scramble an egg, and serve on whole-wheat toast with a glass of milk. Serve leftover hardboiled eggs with a whole grain English muffin and some cut fruit. Only three deviled eggs left? Perfect! Chop them up and spread them on whole-wheat toast with sliced oranges! The possibilities are endless and you save those precious leftovers from being wasted. Whatever you choose, make it healthy, and the early morning meal will surely get you hopping!